I’m going to admit that I went a little bit crazy on fall decorations this year. It’s already October, but I’m slightly embarrassed to admit that I’ve had our house decorated since the beginning of September. 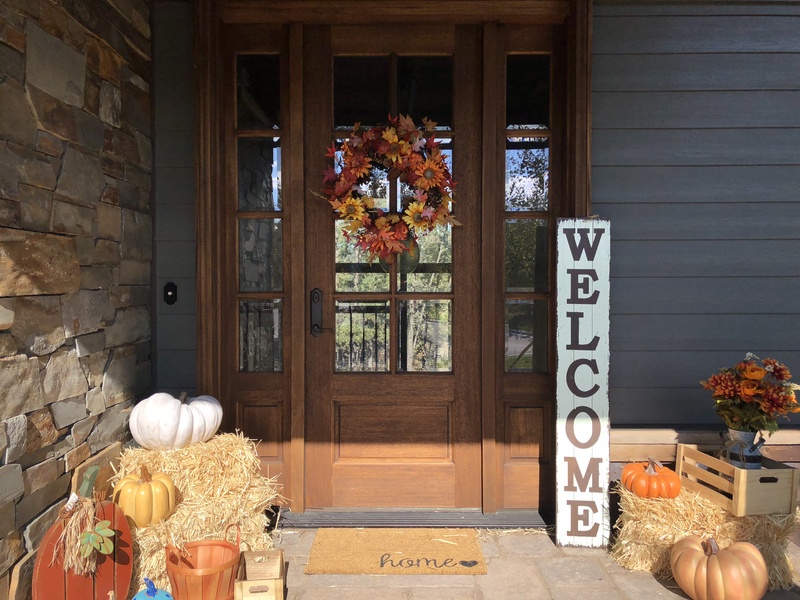 However, now that we’re living in Rapid City, where the weather actually feels like fall, it’s become much more exciting to bust out fall decorations than when we lived in the desert. I was especially thrilled to have a front porch to decorate! So after spending way too much money at TJ Maxx and Hobby Lobby, I decided that I could have just as much fun playing in the kitchen with fall flavors, and hopefully, it’ll be cheaper! I’ve been making this for my family for the last year, even when it’s not pumpkin spice season. We’ve eaten it often on lazy Saturday mornings, but I confess it’s also shown up on our dinner plates as well. I think it’s about time that I’ve included it on my blog as I’ve had numerous family members ask for the recipe. I’m so thankful for Natalie and her blog, Life Made Simple. I haven’t changed a single thing from her original recipe, because it’s pure perfection as is. Since we make French Toast so often at our house we’ve really gotten it down to a science. I keep my Texas Toast in the freezer so that after it’s dipped in the batter it doesn’t become a soggy mess. This particular batter is heavier than your typical French Toast so having the bread frozen beforehand really helps to make sure it doesn’t fall apart. After it’s cooked, the outside will be firm and slightly crunchy, but the inside will still be soft. We always make sure our bread is frozen before we make French Toast. 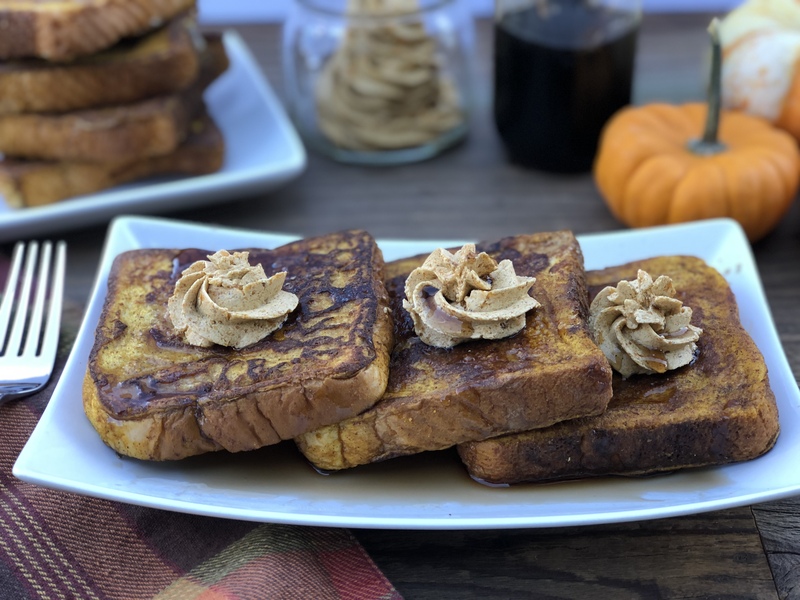 This is the perfect fall breakfast. The cinnamon and pumpkin spice flavors put the same aromas in the kitchen as when we make molasses cookies, which makes me feel like we’re getting ready to eat dessert for breakfast. I hope you enjoy this much as we do! Hooray for pumpkin spice season! 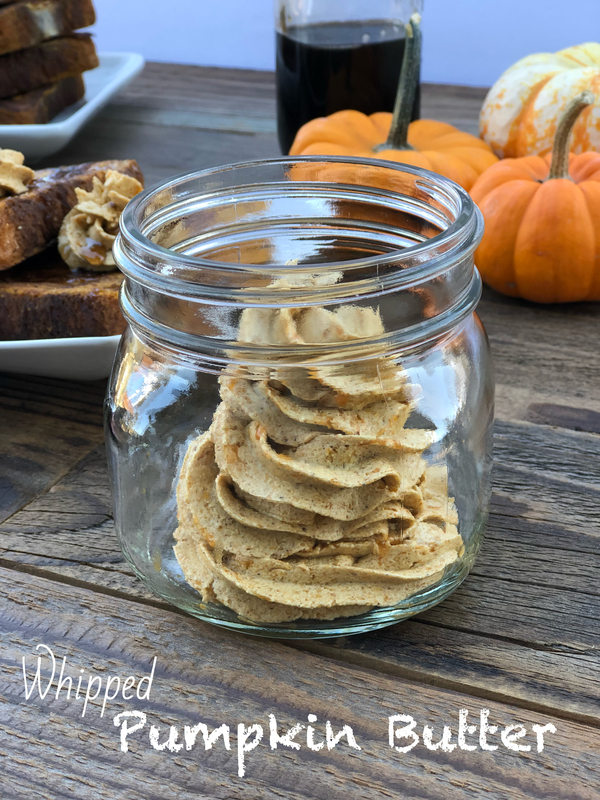 To make the pumpkin butter, first bring the butter to room temperature or put it in the microwave for about twelve seconds. Whip the butter for about two minutes until it’s light and fluffy. I prefer using a stand mixer, but a hand mixer is just fine. Add the cinnamon and pumpkin pie spice and then beat for another minute. Add the vanilla extract and maple syrup and then beat for a minute more. Add the pumpkin puree a little at a time or while the stand mixer continues to run. 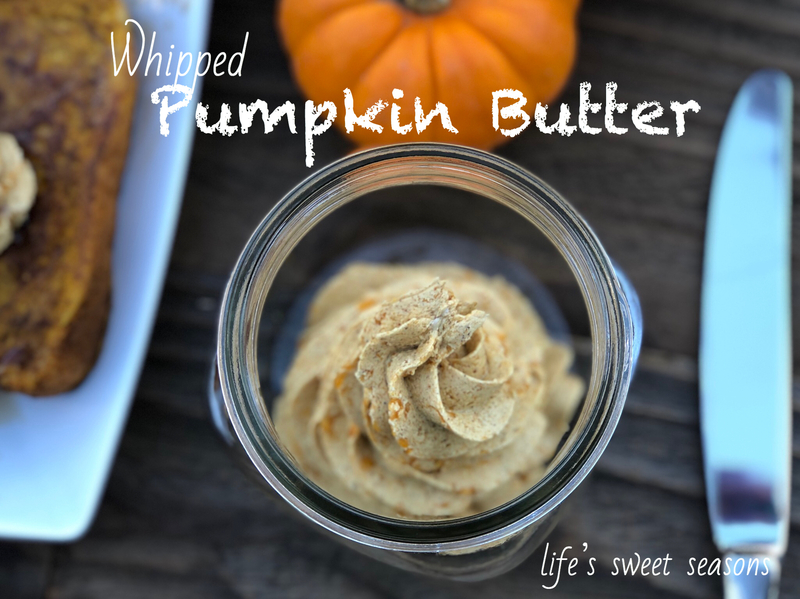 This is super important as I have added all the ingredients at once and then blended, or added the pumpkin before the butter is sufficiently whipped and what results in a chunky mess of delicious ingredients that don’t incorporate. Don’t get me wrong, it still tastes delicious, and after you add the warm syrup it all melts together anyway, but if you want your butter to look appealing, then trust me, whip the heck out of it. Heat griddle to about 400 degrees. Wipe down griddle using a paper towel with some vegetable oil to keep the bread from sticking. If you don’t have a griddle, heat a skillet over medium-high heat. Again, add either oil or butter. 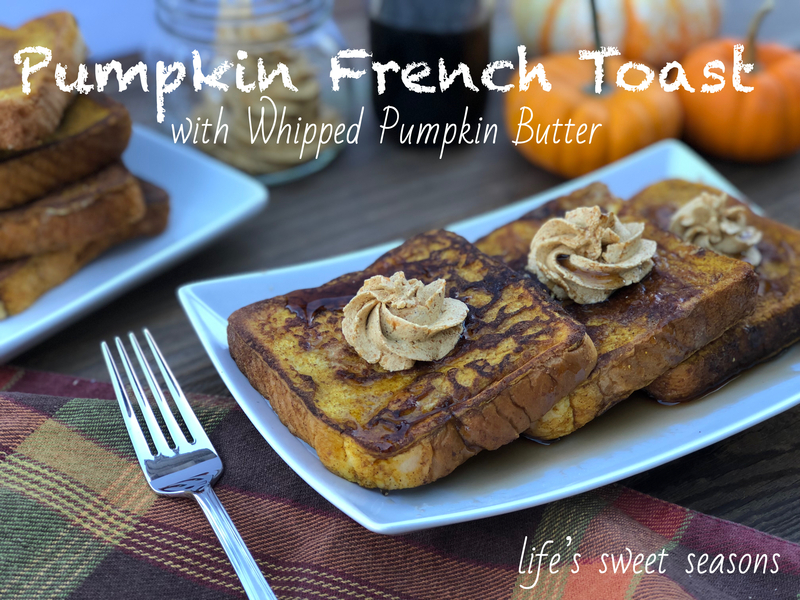 For the French Toast use any baking dish and add eggs, milk, pumpkin puree, vanilla, cinnamon, and pumpkin pie spice. Using a fork or a whisk, break up the eggs and mix everything together until you have a beautiful light orange batter. Drop the French Toast in the batter so that the first side is fully coated and then flip. Add the French Toast onto the griddle and cook for about three minutes and then flip. Each side should be golden brown.